This cute guy is from the set with the saxophone snowman. Equally adorable! 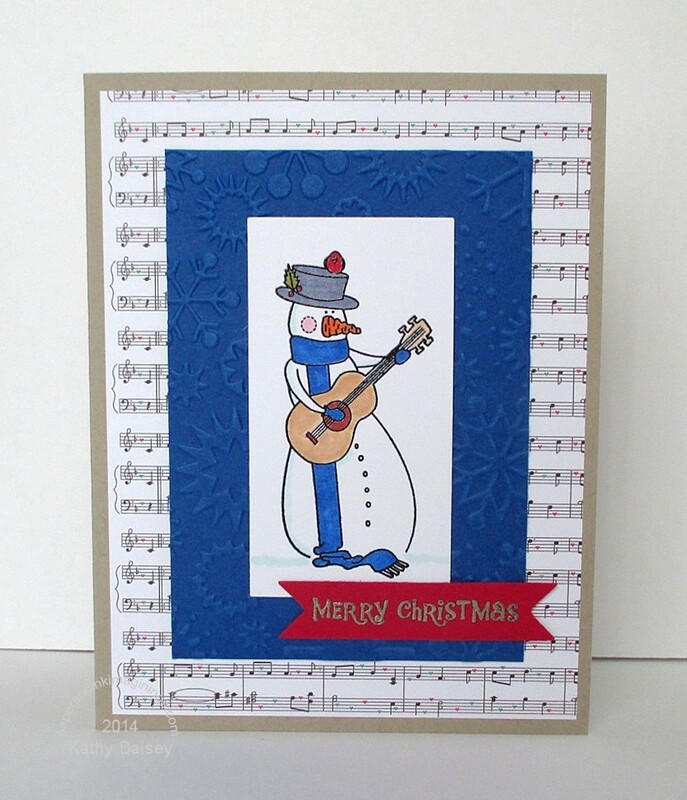 The set comes with a “Merry Christmas” sentiment that looks like notes coming from either the saxophone or guitar. I was wishing for a “happy birthday to you” in the same style, I think that would be so perfect for a winter birthday with either of the musically inclined snowmen. 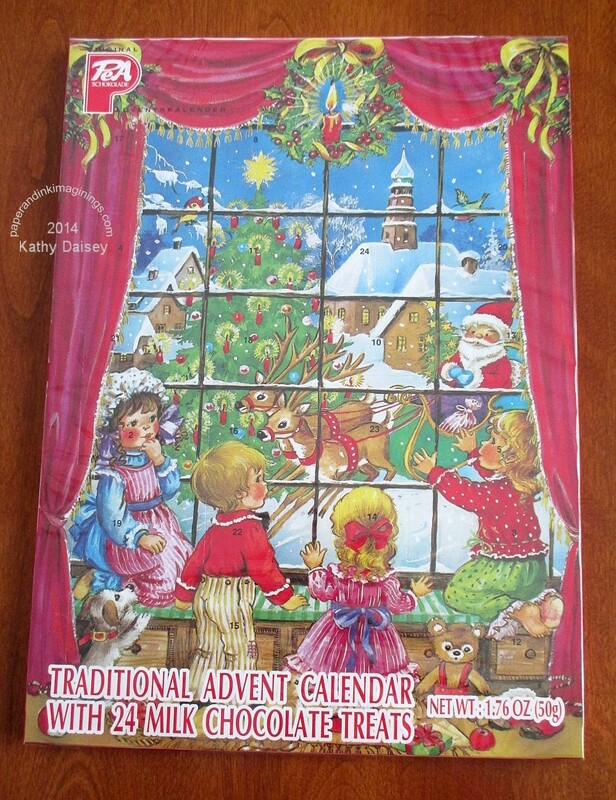 December 1st…time to break out the German Advent calendars! I even remembered to send them with Offspring1 & Offspring2 on the return run to campus last night. Supplies: Stamps – A Muse Artstamps, The Cat’s Pajamas, paper – Lawn Fawn Snow Day, LCI Paper Royal, Papertrey Ink White, Stampin’ Up! Crumb Cake, Real Red, inks – Copic B28, BG10, BV25, E19, E53, R29, RV11, YG95, YR68, VersaFine Onyx Black, dies – Spellbinders (rectangle), Stampin’ Up! (banner), embossing folder – Provo Craft, embossing powders – Filigree Fine Art Powder clear, Hero Arts Liquid Platinum. Categories: card, holiday | Tags: card, Copics, Hero Arts, Lawn Fawn, LCI Paper, Papertrey Ink, Provo Craft, Spellbinders, Stampin' Up!, The Cat's Pajamas | Permalink. This week’s Papertrey Ink Make It Monday (#189) is titled “Impression Line Water Coloring”. The challenge is to use a cover plate (I don’t own any) to emboss, and then to watercolor the embossed image. 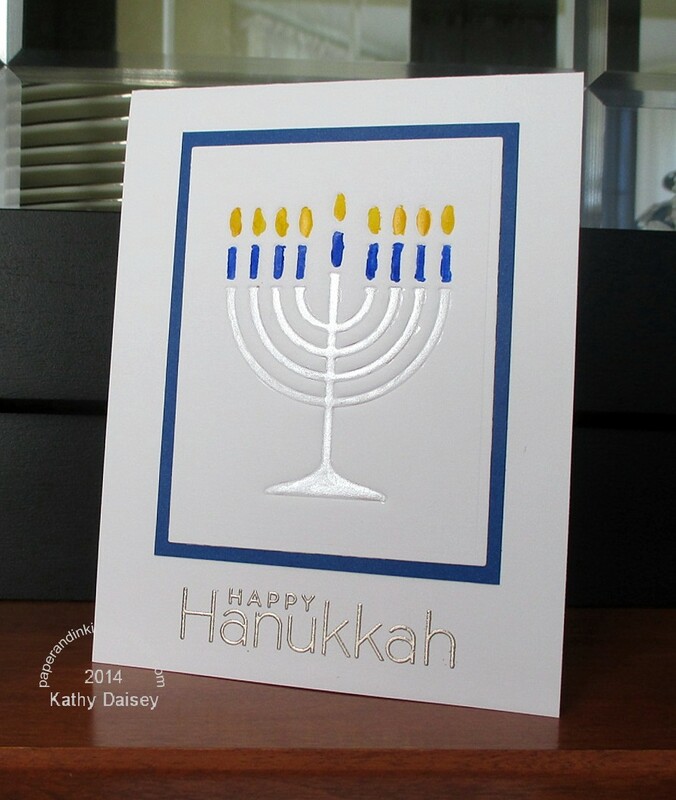 I embossed Papertrey Ink’s menorah inside a rectangle. The image is a bit small for this technique, but overall I am pleased with the result. 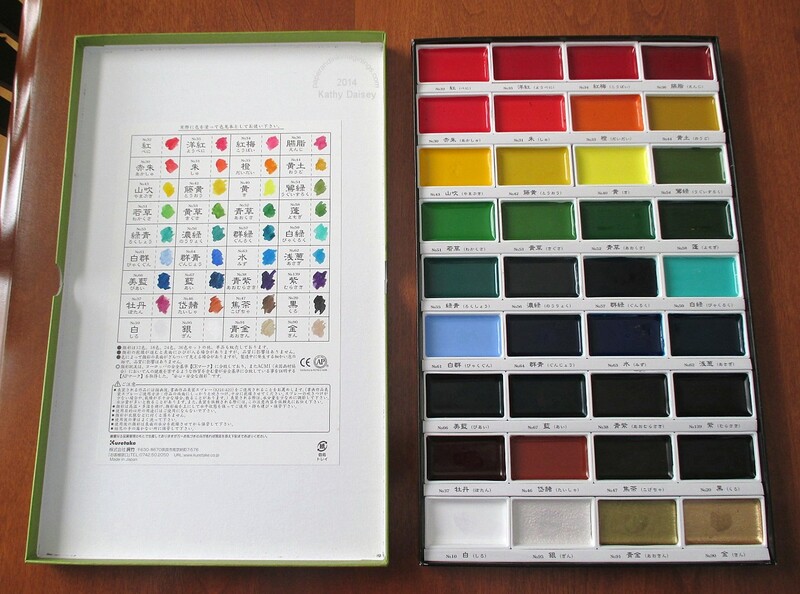 I got to use my new Kuretake Watercolor Paints – a splurge after a big project was recently completed. Supplies: Stamp – Papertrey Ink, paper – LCI Paper Royal, Papertrey Ink White, ink – VersaFine Onyx Black, dies – Papertrey Ink (menorah), Spellbinders (rectangle), Kuretake Watercolors, embossing powder – Ranger Liquid Platinum. Categories: card, holiday | Tags: card, Kuretake, LCI Paper, Papertrey Ink, Papertrey Ink Challenge, Spellbinders | Permalink. These note cards were inspired by an print advertisement in one of the coupon inserts that came with the Sunday paper a few weeks ago. Printed poppies on thank you notes. 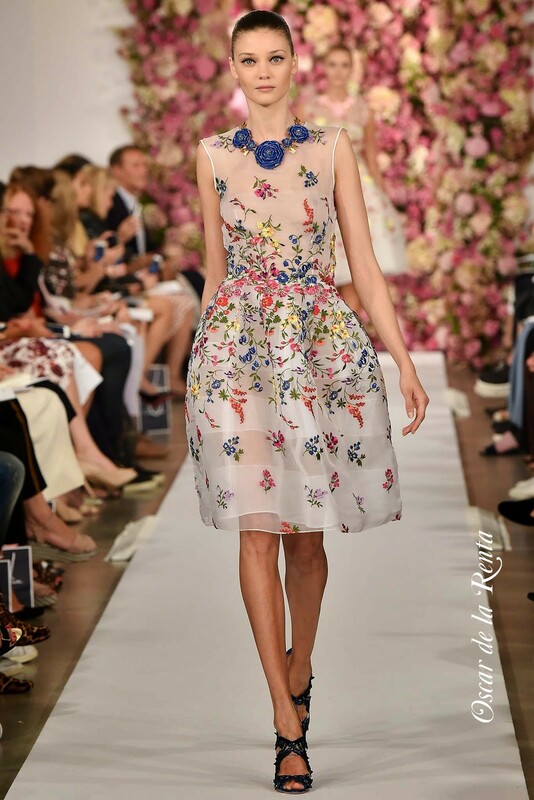 Very pretty. What if I try to make something similar? Hmmm…. I watercolored the round poppies and added the black centers. Once they dried, oh, my, love, Love, LOVE how they turned out. Supplies: Stamp – Stampin’ Up!, paper – Canson watercolor, LCI Paper Royal,Papertrey Ink Vintage Cream. Stampin’ Up! Basic Black, Pink Passion (retired), ink -VersaFine Onyx Black, Reeve’s watercolors (part of a Klutz Press book – Watercolor for the Artistically Undiscovered – given to me by my ex-neighbor in one of her clean out phases), embossing powder – Filigree Fine Art Powder clear. Categories: card, thanks | Tags: card, LCI Paper, Papertrey Ink, Stampin' Up! | Permalink. I am working on samples for shower thank you note cards. Supplies: Stamps – A Muse ArtStamps, Paper Salon, Stampin’ Up!, Taylored Expressions, paper – Georgia Pacific White, LCI Paper Royal, Stampin’ Up! 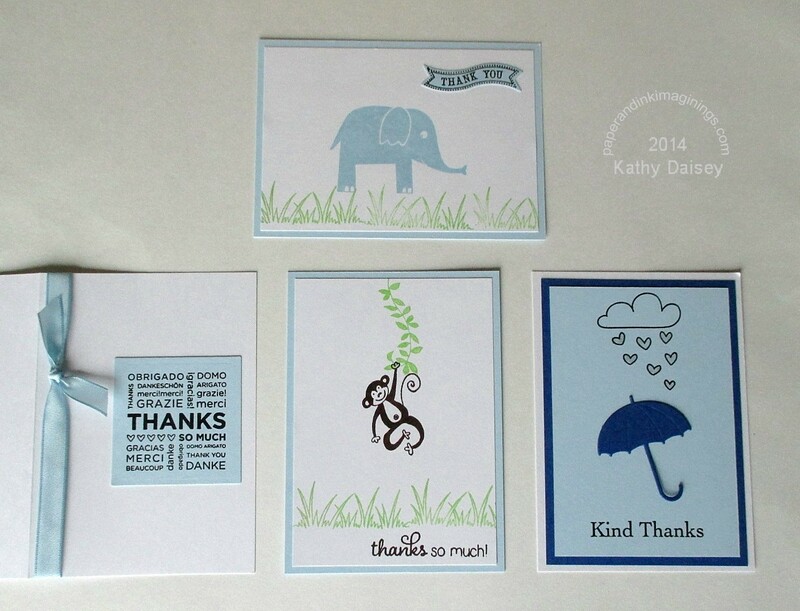 Bashful Blue, inks – Stampin’ Up! Bashful Blue, Chocolate Chip, Gable Green (retired), VersaFine Onyx Black, Wink of Stella clear, dies – Impression Obsession (umbrella), Spellbinders (square), Stampin’ Up! (banner), embossing powder – Filigree Fine Art Powder clear, taffeta ribbon – Stampin’ Up! (retired). Categories: baby, thanks | Tags: A Muse Artstamps, card, Impression Obsession, LCI Paper, Spellbinders, Stampin' Up!, Taylored Expressions | Permalink. Here is the second card I created for my Dad. 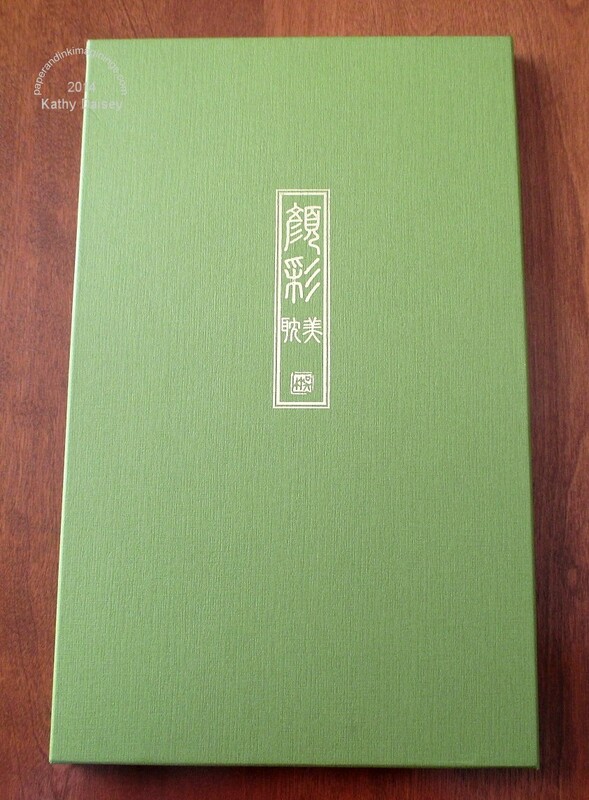 The “80” is actually embossed in silver, but it looks white in the photo. I am still working on transferring between old and new computers…I lost almost all of Saturday struggling to find a mail server workaround to what Windows 8.1 wanted me to use (found one). Supplies: Stamps – Papertrey Ink, Stampin’ Up!, paper – LCI Royal, Papertrey Ink White, Pebbles 4th of July, Stampin’ Up! Real Red, inks – Stampin’ Up! Brilliant Blue (retired), Only Orange (retired), Real Red, YoYo Yellow (retired), VersaFine Onyx Black, VersaMark, dies – Reverse Confetti (tag), Spellbinders (circle), embossing powder – Filigree Fine Art Powder clear, Stampin’ Up! Sterling Silver, twine – We R Memory Keepers. Categories: birthday, card | Tags: card, LCI Paper, Papertrey Ink, Reverse Confetti, Spellbinders, Stampin' Up!, We R Memory Keepers | Permalink. This week’s Papertrey Ink Make it Monday Challenge (#157) is DIY Cover Plates. Cover plates are these things that you use with a die cut machine, and they cut/emboss a piece of paper that is large enough for the front of a card. Papertrey Ink asked us to make our own, using dies we have in our collections. 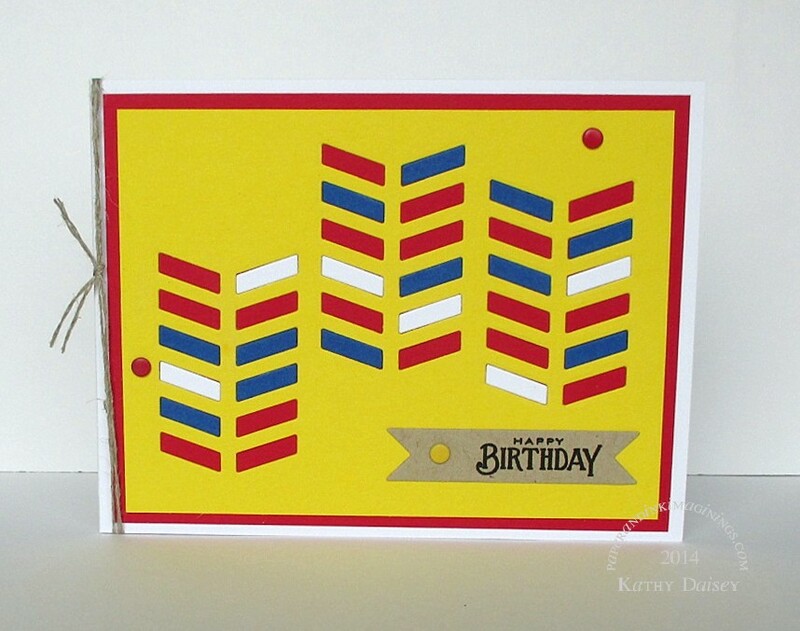 I used the PTI chevron die to make a primary color birthday card. I put the yellow cardstock through the die cut machine (I used my Sizzix Big Shot, I also have an older Provo Craft Cuttlebug) three times with the chevron die in different positions. I then layered the yellow over a piece of red cardstock. I cut chevrons out of white and blue as well, and glued those pieces into the negative spaces in the yellow. If I make this card again, I would alternate the direction of the chevron die on the base paper, just for a little variety. Supplies: Stamp – Papertrey Ink, paper – LCI Royal, Papertrey Ink Kraft, White, Stampin’ Up! Real Red, YoYo Yellow (retired), ink – VersaFine Onyx Black, dies – Papertrey Ink (chevron), Stampin’ Up! (banner), enamel dots – Stampin’ Up!, linen thread – Stampin’ Up! 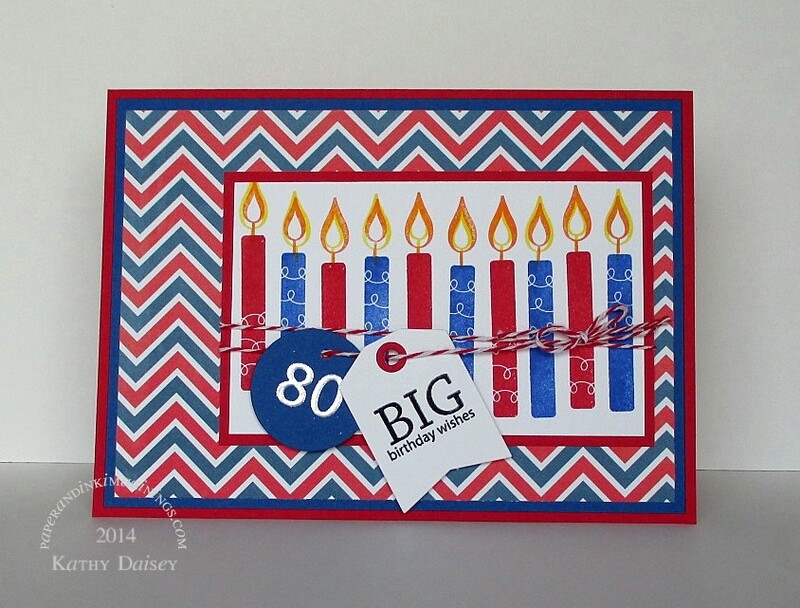 Categories: birthday, card | Tags: card, LCI Paper, Papertrey Ink, Papertrey Ink Challenge, Stampin' Up! | Permalink.